the SC is easily my favorite bag of the entire Vuitton line-up. however, like all super luxe handbags these days, the price just keeps creeping up season after season. luckily, the next best thing is quite affordable and just as cool. behold the CV duffel: different initials, same effortlessly-chic style, made in the USA, actually affordable. i happened by the navy calf version in the shop recently, and the leather + minimal hardware looks and feels quite lovely and sturdy in person. do you have the SC or a similarly styled duffel? what do you think? 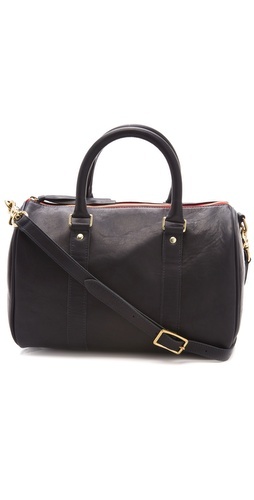 The duffel has to be my favourite style as far as bags as concerned. I love Clare Vivier's bags, but wish the zip extended down the sides a little. The opening is a little narrow for my taste. I own the DVF Drew duffel in burgundy goatskin, which I adore. It's wonderfully slouchy and durable. I also like my Alexander Wang Daria duffel in black bubble leather (that leather is indestructible, by the way) and gunmetal hardware and a bespoke glossy red duffel I purchased from Belen Echandia when I turned 30. Am currently looking into getting a bespoke nappa leather duffel made in Delhi this summer, which will probably be the last bag I buy for a while. i love that you have variations of your fave bag style. i'm curious what bespoke details you plan on getting for your artisan duffel! Well, you know me. I am all about uniforms :) The bespoke bag is still in the early stages, I have yet to choose my leather, but want something neutral, fairly free of hardware (along the lines of the SC/CV duffels). Will let you know once it's ready. Ah, you got my hopes up. Affordability is all relative, I suppose. What would you buy if you needed a good leather handbag but a budget of less than $200? TJ Maxx or Nordstrom Rack (I find they have a better selection than Loehmanns) for leather bags. TJ always has a lot of Michael Kors/Ralph Lauren bags and unbranded Italian made bags, Nordstrom's Rack usu has rebecca minkoff/cole haan bags. Furla and Kenneth Cole New York make great leather bags, moderately priced, and you can get good deals on them when they go on sale or via ebay. Even Banana Republic and the Lauren Ralph Lauren have well made leather bags. @Unknown - i must chime in that i find it worthy to splurge on a well-chosen leather bag only because the cost per wear of one that's practical and suits your life/style really balances out in the end. I've admired the CV duffel online, but have not had the chance to see in person. The bags look gorgeous and are the perfect blend of structured but casual. One thing I have heard about the CV bags is that since they are unlined, the darker color dye can rub on the contents of the bag. Did that seem to be the case with the one you saw, or has anyone else experienced this? hey jen - this cv duffel has a nice canvas lining actually so all clear on that front! I have the Clare Vivier messenger in black and can confirm that the dye does indeed rub off a little bit (thankfully my LV wallet hasn't been affected, but it's still a nerve-wracking thought!). The interior also sheds little bits of fluff, which is also annoying. It's not what you want to deal with when you pay upwards of $300+ for a handbag. I've got a CV messenger in navy, and for me the fluff-shedding has been minimal (some, but very little). Also, haven't noticed any dye rubbing on any of my items inside, but my wallet/purses inside are dark-colored. One of the rivets fell out on my messenger after 6 months of ownership, and they fixed it for free. @minima - that's good to hear - i always like a brand that stands behind its products and does prompt repairs when necessary. I understand that items (especially luxury items) gradually become more expensive over time as the cost of production increases, but LV seems to be particularly aggressive with their price increases for the SC line. Why do you think that is? playing the exclusivity game, i think. chanel has been doing the same for several years now, to many longtime customers' dismay. I have this exact CV bag, Miss S, in the navy, and I love it. Only issue is it's too small to hold a laptop, even a small one, so it can't come with me daily to work. I now perceive bags as mostly either work-size or play-size and so medium-size bags like this seem to have little place! That said, at the price it is a great duffel. The extra $4500 will go to that vintage Kelly to keep company with my beloved Birkin. um and i love that you are an Hermes fan - what color/leather is your birkin?? My Birkin is gold Clemence 35 with palladium hardware :) A great colour as it shows off the H leather but is also understated. I love it far too much. I am right this very second in debate re pulling trigger on a Rouge H Kelly 28 which is only missing a shoulder strap. You have a Kelly and adore it, yes? yes i do and mine is a vintage H kelly - super practical and i love it! how practical do you find your birkin? I would find the Birkin eminently practical if a) I had not started worrying about it once I scuffed it a few times - so I've learnt not to overstuff it, throw my laptop in, etc. - and b) It carries a message, so while I would never hide it from my super-casual tech startup workplace- I do occasionally carry it - but it doesn't fit in there and I do think about when and where I take it. But as a bag and not a symbol? It's just a gorgeous, functional, roomy piece of leather! If I had it to do over again I would have found, say, pre-loved Barenia, which is meant to be USED and USED. BTW I just bit the Kelly bullet- 28 cm Rouge H box calf from 1980. It hasn't even arrived but I am already wondering if I'll find it practical without a strap. I will have to get one made, I think, as H takes over a YEAR. I'm so glad you find a Kelly practical, gives me hope! oh congrats on your beautiful vintage kelly! also your comment got me thinking and inspired my latest post :) feel free to chime in! the duffel style purse hasn't really appealed to me. I agree with Ammu when the opening doesn't extend down the sides it makes the opening too narrow, and you can "cut" your hand along the zippers. eesh. yeah i think the hardware on the CV is fine and high quality. i've only had that unpleasant zipper catching on my hand once on a poorly made bag from ages ago. Is the SC duffel still available in LV stores? off and on it seems. the ladies on TPF have the latest intel. I'm a huge fan of duffel bags. In fact, I've dreamed of getting a SC bag for years. I nearly caved in several times and ended up with the Speedy Bandouliere as a substitute only because my camera gear inside a heavy bag would be a killer on my shoulder. Have you seen the new version of the SC x LV duffle with its contrast lining? Only saw a quick pic but the "older" version that is far more elegant in my opinion. What I love about this kind of bag, like my Céline (hehe!) is its versatility. You can play it up or down, it can be casual or sophisticated. like lindsay said, i'm really not feeling the new colorways of the SC in the brights and contrasts. navy et burgundy all the way in my book! Duffels are so sophisticated, but they can also be quite smart casual too. The SC x LV duffel is so elegant. It is heavy, but that's the mark of a well constructed bag. Just look at how heavy Hermes bags are! The CV duffel is fabulous too. I have her clutches, which are nice when I want something understated and streamlined for evening. agree with you completely. 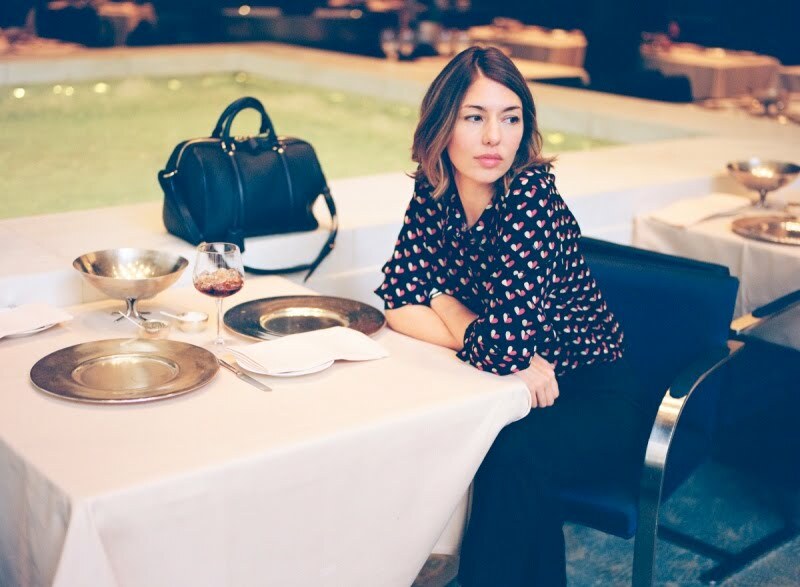 and i loved how you wore the clutch during our blogger dinner!